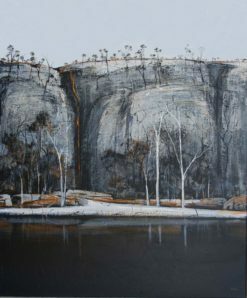 Ingrid Windram has forged a strong artistic career starting with her first solo exhibition in South Australia in 1982. 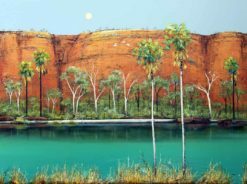 10 years later she moved to the Kimberley region and it is here that she embraced the incredible landscape that has remained her strongest inspiration to this day. 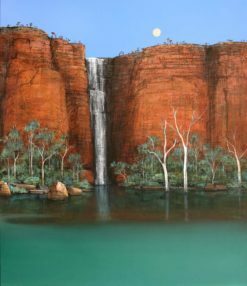 Ingrid Windram has travelled extensively throughout the Kimberley on field trips and boat trips and captures the essence of it’s unique light and vibrant colour, allowing the viewer to feel an immediate connection, a familiarity to that place even if they have never visited it. When did you first feel the desire to be an artist? The best memories I have are of my father as a child, when watching him do drawings and designs at night at the kitchen table, I could see he loved doing his art and this is where my first desire to do art came from. 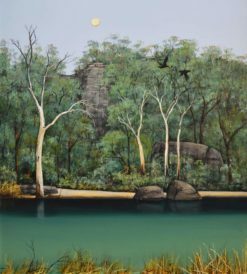 In my early 20’s I remember seeing an Arthur Boyd painting and was totally captivated by his art, I loved the freedom and expression in his work. Where did you learn your art ? 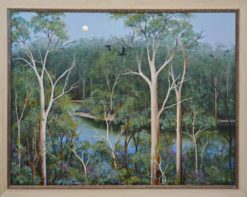 To begin I enrolled in a local art class in the Adelaide hills, the art teacher was an awesome inspiring artist and great teacher. We became friends and she would invite me along to art field trips. 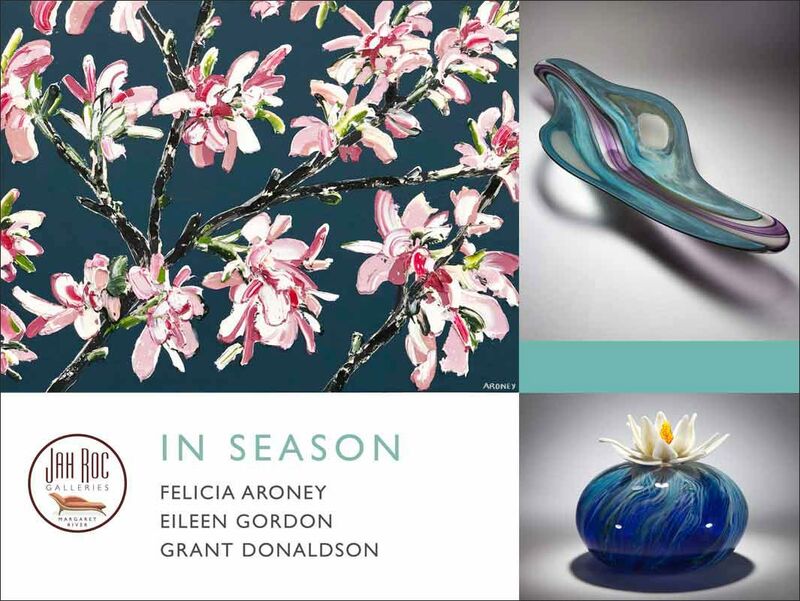 We would be totally engrossed in the surrounding subject matter and the art we produced. My art teacher strongly suggested to me that I owed it to myself to go to art school. I spent the next six years studying full time. 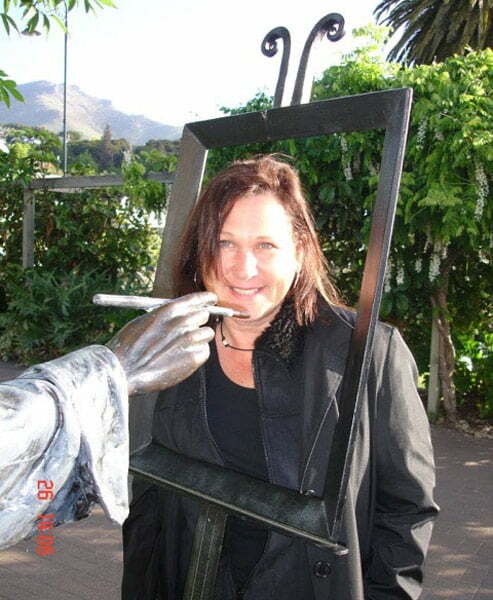 I went to Mt Barker Tafe course and enrolled in the advance certificate in painting and drawing. From there I completed a further 2 years, full time at Stanley street school of art. To complete my studies, I did a final 2 years at Hartley College of Advanced Education in South Australia. 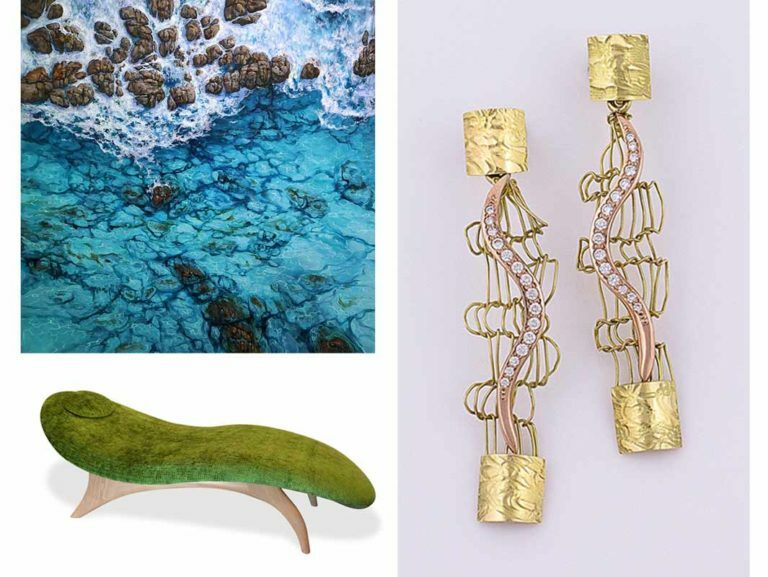 Nature and life provide me with all the elements that I need for creativity and inspiration. 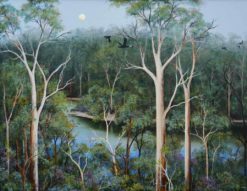 I am drawn to the essence of the landscape, the things you don’t see, like the mood and the evoked emotions, the Wow Factor. What message are you sending to the viewer of your art? 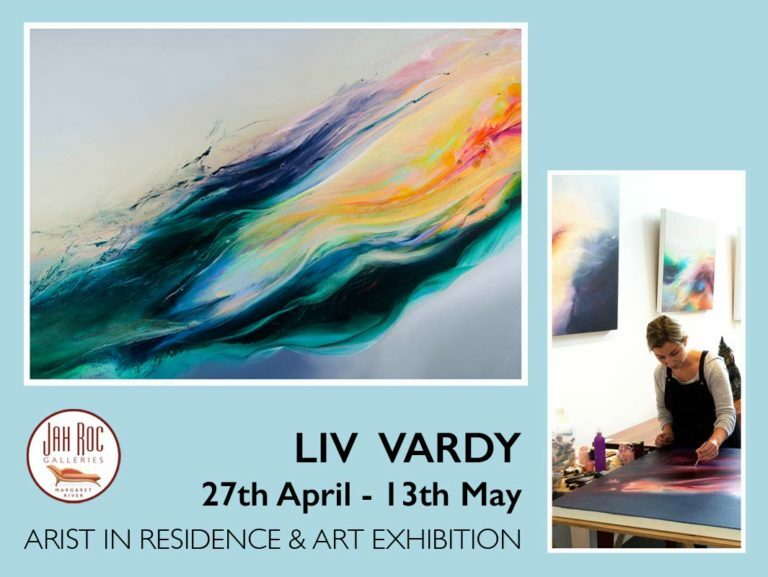 I paint the essence of what I see, and in doing so I try to inspire the viewer to appreciate nature and all of what it has to offer. I currently have three Studio’s. My main studio in front of my home is used for large paintings in their initial stage that requires a lot of paint to be moved around, so it is what I guess typifies an art studio for most people. The second is my Green Room that is utilised for my finishing work. It is flooded with great natural light and a beautiful garden outlook. The last space but the most important one is the natural stage that we all live in, sketching outdoors and soaking up the landscape. What mediums do you use and why? I love many mediums and am comfortable with most of them but I guess my favorite would be high quality acrylic paints, and French rag papers and hand stretched canvases. The acrylic paints are very versatile, they can be used as a watercolour wash or mixed with mediums that can become quite textural. I am also very passionate about the surprisingly versatile humble charcoal, intricacies and depth are achievable with this very simple creative medium. What are your career achievements you are proud of? 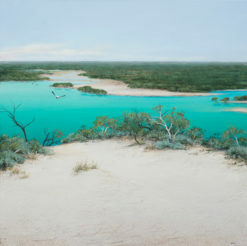 The “Aurora 11” exhibition at the Cable Beach Club, Broome. 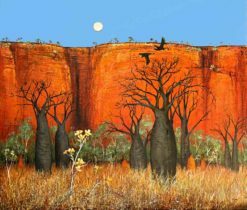 This exhibition was a culmination of my 9 years working in and being inspired by the Kimberley region. There was a surprise opening by John Olsen, renowned Australian Artist. I have always admired the work of John Olsen so this was a great honour. I love art! The freedom of expression, I love immersing myself in painting, it’s all the emotions in one. It has been and will continue to be an awesome journey. 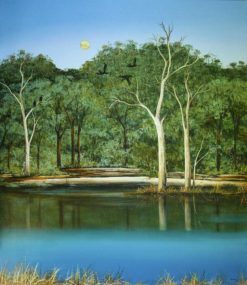 This entry was posted in JahRoc Artists | Up Close and Personal, News and tagged acrylic on canvas, Artist Studio, Australian Landscape, Boab Trees, Broome Artists, Collectable Art, Ingrid Windram, Kimberley Paintings, Landscape Art, Margaret River Art Gallery, Modern Art, South West, West Kimberley, Western Australian Artist.